The AllerGard™ ES (Energy Saver) NU-607 Class I Animal Waste Station minimizes the risk of exposure to allergens and animal infections for the technician handling low to moderate risk materials through HEPA filtration and an air barrier. 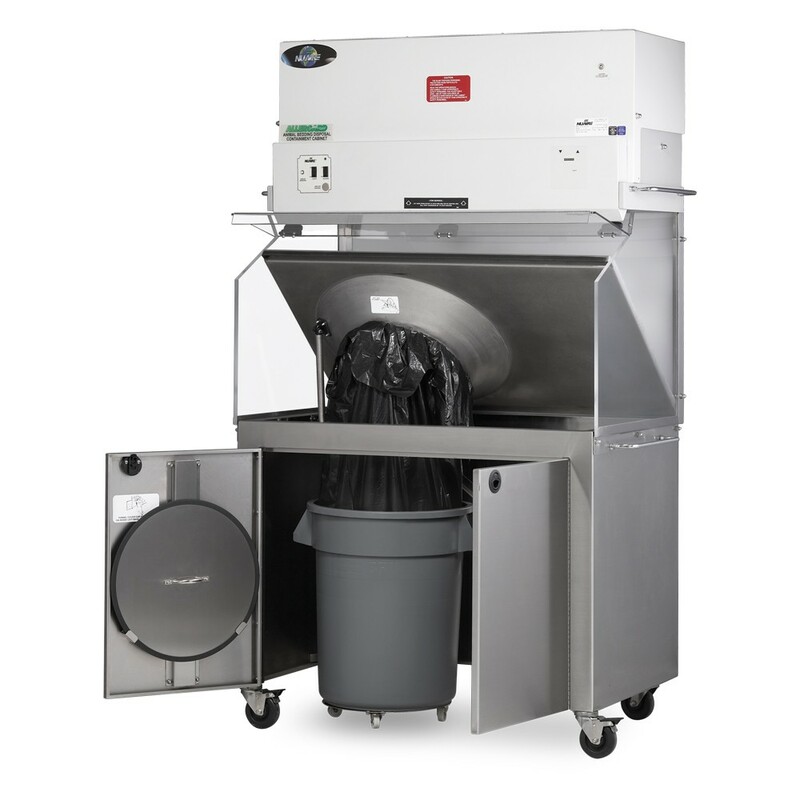 The AllerGard™ ES NU-607 Class I Animal Bedding Disposal Station ensures your safety and protection with its impressive HEPA filtration system and ergonomic design to prevent injury from poor body positioning and awkward movements. The NU-607 offers the best with an active air barrier with its 100 FPM inflow velocity. This ensures that particulates and other contaminants such as feces, dust and dander stay where they should -- within the disposal station, instead of entering the air. The AeroMax™ Electronic Control System will not let you down with its intuitive and smartly designed features. The cabinet's airflow is electronically monitored through a digital pressure transducer, and an alarm sounds in the event of low or excessive airflow in the unit. Cool white lighting is standard with the NU-607, making it easier to see the task at hand. Your eyes will rest easy with the highly efficient and bright lighting in each unit. You need not struggle with difficult-to-reach corners or tiny access openings. The NU-607 has a large 16-inch (356 mm) access opening. The NU-607 is available with three work surface configurations, including a square full work surface, a circular surface with bang bar left and a double square with two waste receptacles for heavier workloads. The NU-607 does not skimp on the details when it comes to your comfort and ease of use. The work surface is situated at a proper standing height, while the large work zone creates the perfect area to clean properly and dispose of cage waste. The hinged, angled viewing panel is made from heavy clear acrylic, so you have visual access to the task at hand. From the stainless steel work surface to the transparent acrylic side panels and heavy duty stainless steel cabinet, the NU-607 is incredibly easy to maintain and keep clean. The waste bins, whether you choose the single or dual bin model, are built right into the work area, making it incredibly easy to reach and remove.